The late RADM Chuck Grojean, Executive Director, Admiral Nimitz Foundation, Fredericksburg, Texas. The National Museum of the Pacific War, Fredericksburg, Texas, is the only institution in the continental United States dedicated exclusively to telling the story of the Pacific Theater battles of World War II. Located on a nine-acre site, the Center includes the George Bush Gallery, Admiral Nimitz Museum, Plaza of Presidents, Veterans' Walk of Honor, Japanese Garden of Peace, Pacific Combat Zone, and the Center for Pacific War Studies. A major feature of the museum is the Memorial Wall (right). 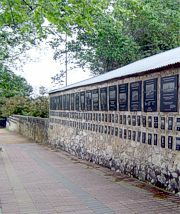 Images of individual plaques from the Memoral Wall on this web site include USS Edsall, DesRon 29, Battle of Balikpapan, DesDiv 59/60, USS Conyngham, USS Smith, USS Craven, USS Ralph Talbot, USS Hughes, USS Fletcher, USS Radford, USS Jenkins, USS O’Bannon, USS Chevalier, USS Taylor, USS Converse, USS Spence and USS Hugh W. Hadley. Originally named The Admiral Nimitz Museum and housed solely in the historic Nimitz Hotel, the museum has grown into a dynamic, first-class experience that people of all ages and from all backgrounds can enjoy. In addition to more than 50,000 square feet of indoor exhibit space, the museum boasts an impressive display of Allied and Japanese aircraft, tanks, guns and other large artifacts made famous during the Pacific War campaigns.